The Dances of Universal Peace logo was created by Marc Takaha, a graphic artist and long-time member of the Hawaii Sufi community. In Marc's words, "I originally rendered what Guidance had offered in a form that could for practical reasons be reproduced easily, with some flexibility. From a graphic design perspective, a good logo or "mark", should hold up on its own in black and white. Distilled essence of visual communication is hallmark of effective design. Less is more so to speak. The "Target" mark is an example: simple and instantly recognized. The circle of hearts logo is registered to Dances of Universal Peace International. The logo may be used by all members of the Leaders Guild of the Dances of Universal Peace, as well as for official business of the organization. The words "Dances of Universal Peace" should appear near the logo whenever it is used. 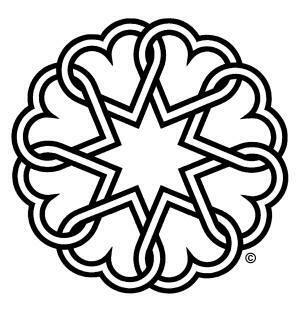 In the United States, the ‘sm’ (service mark) must appear with and near the circle of hearts; in the rest of the world (c) (copyright) should be shown. The logo may be copied from the following representations. The .JPG files are useful in print publications and the .GIF files are best for web applications. At the bottom of the page are examples of the logo with the words attached. To save any image below to your computer, right click the image and choose "save as" and then location. Click higher resolution .tif version to download a logo to which you must add the (c) or sm mark. Please do not alter the logo as presented, for example, making the hearts different colors. The logo was designed to be recognizable whether rendered in color or black and white. Altering the logo in such a way weakens its design and waters down the strong association that the Dances of Universal Peace have had with it since 1983.